We were invited to attend as media for the event. As always all opinions are honest and my own. JustaBXgirl is a huge fan of The Magic School Bus. She prefers the original version to the new version with the Frizz’s sister but thinks that one is cool too. This weekend she is in for a special treat. We are going to check out the live version of the show at BMCC Tribeca Performing Arts Center thanks to TheaterWorksUSA. I remember in college I once went to a live performance of The Magic School Bus. Yes, I said during college. Don’t judge me, I’ve always been a fan of the Frizz. Going to the live show is like being on a field trip with the Frizz! And I can admit that this mama is just as excited to head on this one with JustaBXgirl. If your little is a fan then you want to run and get one of the few remaining tickets as it is a one-day performance happening TOMORROW!!! Tickets are $30 and can be purchased by heading over to TheaterWorksUSA’s website. While you’re there you can check out all of the other really cool stuff they have going on and coming up like, Dog Man The Musical. It will be out this summer and we are hoping to get to see it as the book is a favorite series of one of JustaBXgirl’s good friends. 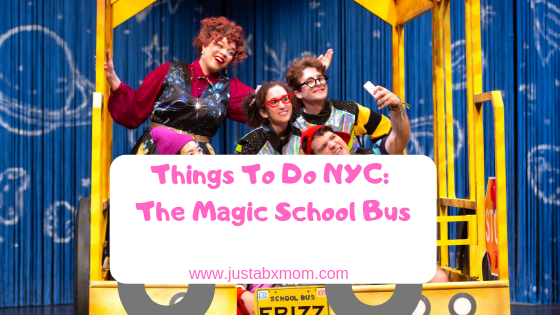 Hop on the Magic School Bus for a ride with Arnold, Ralphie, Carlos, Wanda, Janet – and, of course, Ms. Frizzle and Liz – in this new musical adaptation based on the original book by Joanna Cole and published by Scholastic. When the class gets lost on the way to the planetarium, Ms. Frizzle saves the day by blasting into outer space for an epic interplanetary field trip! But when rivalries both old and new threaten to tear the students apart, our young heroes must learn to pull together or risk getting forever lost in the solar system. Recommended for ages 6 to 12. It was a really fun show. JustaBXgirl had seen the episode before so she was excited to know what would come next.